Comments: USED US EDITION BOOK - Items do not contain any supplemental materials even if listed in the title. Books have stickers, highlighting, writing, or tape used to mask instruct edition. Pages and Cover may have creases, scratches, or slight water damage. Consumable items are filled out and completed. We ship out most orders within 1 business day with tracking. 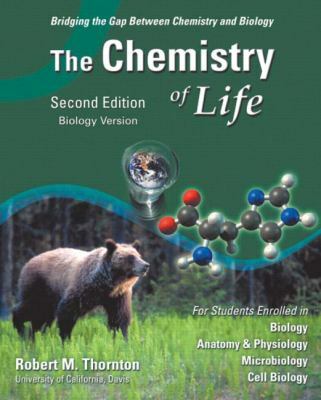 The Chemistry of Life CD-ROM is intended to teach the essentials to students encountering chemistry for the first time, as well as those needing a thorough review before continuing with their science or allied health coursework. Using a highly interactive format, The Chemistry of Life CD-ROM explains and illustrates crucial concepts and principles such as atomic structure, properties of water, pH, buffers, enzyme function, and the structure and function of macromolecules. Learning is reinforced by presenting students with animations, encouraging interaction, then testing their grasp of the material with interactive quizzes.Thornton, Robert is the author of 'Chemistry of Life, Biology Version', published 2002 under ISBN 9780805330632 and ISBN 0805330631. Loading marketplace prices 21 copies from $3.71 How does the rental process work?